Beginning at 11am PST on October 22, former Vice President Al Gore and the The Climate Reality Project will stop the clock for a full 24hrs to focus the world's attention on the greatest challlenge of our time: climate change driven by carbon pollution. With our global broadcast 24 Hours of Reality: The Cost of Carbon, we'll bring together artists, scientists, celebrities, economists, and other experts to explore the many ways we're all paying for carbon pollution in our daily lives-wherever we may live-and how we can solve this with a market price on carbon. 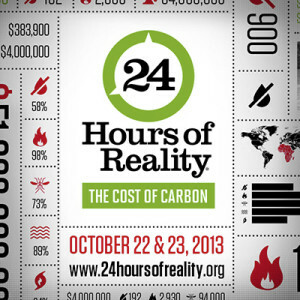 Click here to view the 24 things to know about the 24hrs of Reality-Climate Reality. Click here to view the world wide schedule.